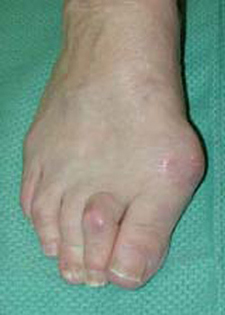 Deformity of the big toe associated with a bone prominence on the inner side of the toe is referred to as a bunion (hallux valgus) – Figure 1. This deformity may be hereditary, and is aggravated by shoe wear. Initially, this condition should be treated by wearing, wider fitting shoes. Surgical correction is recommended if the foot remains uncomfortable despite appropriate modification of shoe wear. In our clinic, your surgeon will carefully assess each bunion and will individually select one of a variety of possible procedures to best correct the deformity. Depending on the technique that is selected a combination of screws or staples are used to re-position and hold the bone. These surgeries are usually performed as a day-case procedure or overnight stay in hospital. Commonly they are performed under intravenous sedation combined with a local anaesthetic ankle block. This avoids the frequent troubles of nausea and vomiting following a general anaesthetic. Patients are usually able to walk on the operative foot immediately in a special rigid-soled postoperative shoe. 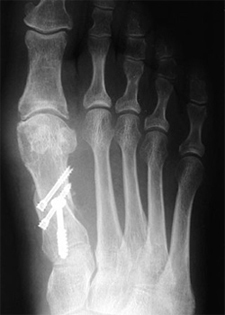 This patient was treated by re-positioning the metatarsal and holding the bone secure with screws. 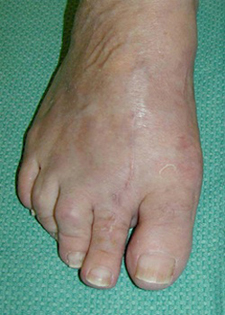 Pre-operative photograph of a patient who presented with a symptomatic bunion. 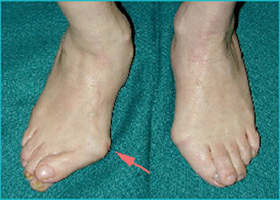 The patient reported pain in the region of the bunion while wearing shoes. 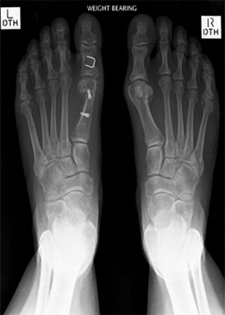 Pre-operative x-ray of the same foot. Post-operative x-ray. 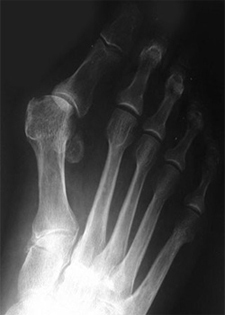 The deformity has been straightened by firstly cutting and then repositioning the first metatarsal bone. The corrected position has been held with three screws. 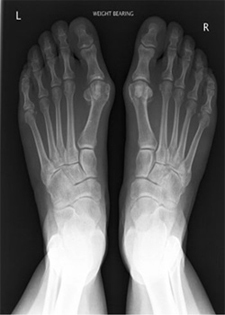 Xray demonstrating moderate Hallux valgus deformities in both feet. The left foot was symptomatic for the patient with rubbing of the bony prominence in shoes. Our practice uses interactive computer modules for patient education and appropriate informed consent. This is a brief demonstration of the Scar Osteotomy module.